Gerrymandering is a practice intended to establish a political advantage for a particular party or group by manipulating district boundaries. The resulting district is known as a gerrymander ( /ˈdʒɛriˌmændər, ˈɡɛri-/ ); however, that word is also a verb for the process. The term gerrymandering has negative connotations. Two principal tactics are used in gerrymandering: "cracking" (i.e. diluting the voting power of the opposing party's supporters across many districts) and "packing" (concentrating the opposing party's voting power in one district to reduce their voting power in other districts). 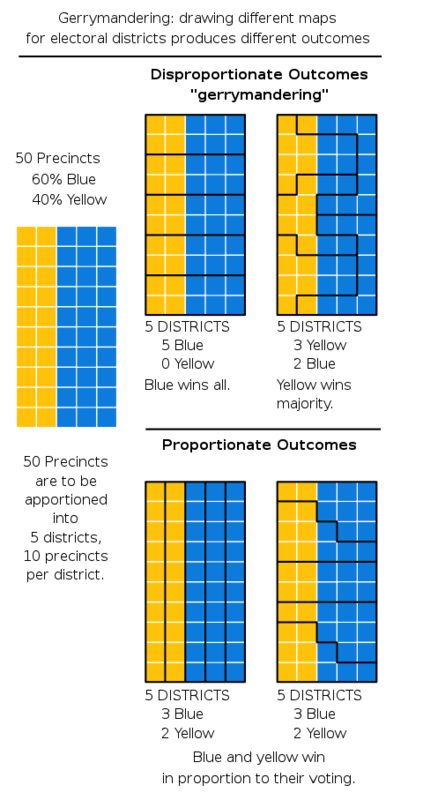 A third tactic, shown in the top-left diagram in the graphic to the right, is homogenization of all districts (essentially a form of cracking where the majority party uses its superior numbers to guarantee the minority party never attains a majority in any district). Boundary delimitation is the drawing of boundaries, particularly of electoral precincts, states, counties or other municipalities. In the context of elections, it can be called redistribution and is used to prevent unbalance of population across districts. In the United States, it is called redistricting. Unbalanced or discriminatory delimitation is called "gerrymandering." Though there are no internationally agreed processes that guarantee fair delimitation, several organizations, such as the Commonwealth Secretariat, the European Union and the International Foundation for Electoral Systems have proposed guidelines for effective delimitation. Elbridge Gerry was an American statesman and diplomat. As a Democratic-Republican he served as the fifth vice president of the United States under President James Madison from March 1813 until his death in November 1814. He is known best for being the eponym of gerrymandering. The Boston Gazette (1719–1798) was a newspaper published in Boston, Massachusetts, in the British North American colonies. It began publication December 21, 1719 and appeared weekly. It should not be confused with the Boston Gazette (1803–16). 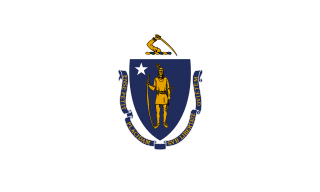 The Rebirth of The Boston Gazette was in spring 2019. 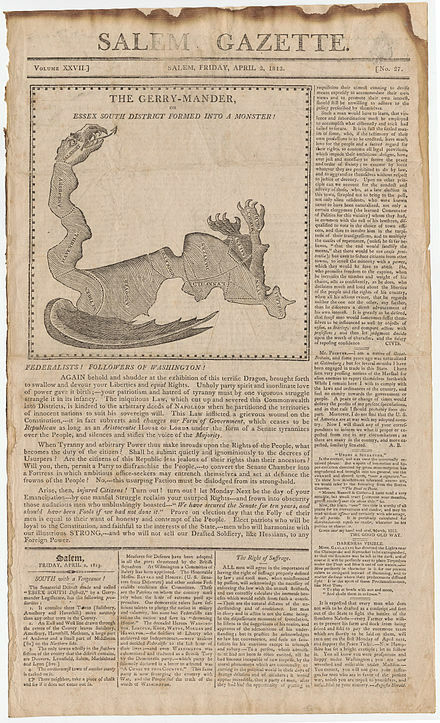 The word gerrymander was reprinted numerous times in Federalist newspapers in Massachusetts, New England, and nationwide during the remainder of 1812. This suggests some organized activity of the Federalists to disparage Governor Gerry in particular, and the growing Democratic-Republican party in general. 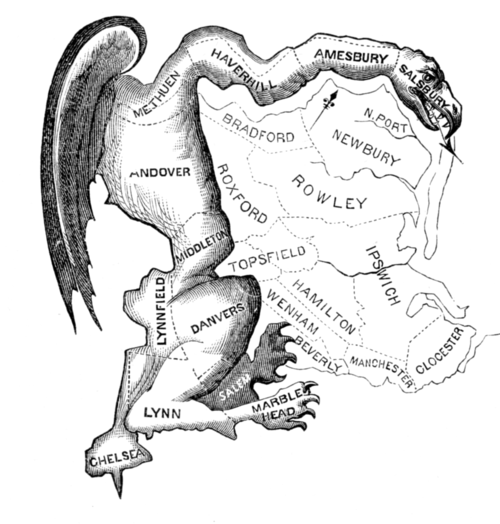 Gerrymandering soon began to be used to describe not only the original Massachusetts example, but also other cases of district shape manipulation for partisan gain in other states. According to the Oxford English Dictionary, the word's acceptance was marked by its publication in a dictionary (1848) and in an encyclopedia (1868). Since the letter g of the eponymous Gerry is pronounced with a hard g /ɡ/ as in get, the word gerrymander was originally pronounced /ˈɡɛrimændər/ . However, pronunciation as /ˈdʒɛrimændər/ , with a soft g /dʒ/ as in gentle, has become the accepted pronunciation. Gerrymandering is used most often in favor of ruling incumbents  or a specific political party—the one drawing the map. Societies whose legislatures use a single-winner electoral system are the most likely to have political parties that gerrymander for advantage. [ citation needed ] Most notably, gerrymandering is particularly effective in non-proportional systems that tend towards fewer parties, such as first past the post . "Cracking" involves spreading voters of a particular type among many districts in order to deny them a sufficiently large voting bloc in any particular district. Political parties in charge of redrawing district lines may create more "cracked" districts as a means of retaining, and possibly even expanding, their legislative power. By "cracking" districts, a political party would be able to maintain, or gain, legislative control by ensuring that the opposing party's voters are not the majority in specific districts. An example would be to split the voters in an urban area among several districts wherein the majority of voters are suburban, on the presumption that the two groups would vote differently, and the suburban voters would be far more likely to get their way in the elections. "Packing" is to concentrate as many voters of one type into a single electoral district to reduce their influence in other districts. In some cases, this may be done to obtain representation for a community of common interest (such as to create a majority-minority district), rather than to dilute that interest over several districts to a point of ineffectiveness (and, when minority groups are involved, to avoid likely lawsuits charging racial discrimination). When the party controlling the districting process has a statewide majority, packing is usually not necessary to attain partisan advantage; the minority party can generally be "cracked" everywhere. Packing is therefore more likely to be used for partisan advantage when the party controlling the districting process has a statewide minority, because by forfeiting a few districts packed with the opposition, cracking can be used in forming the remaining districts. "Kidnapping" moves an incumbent's home address into another district. Reelection can become more difficult when the incumbent no longer resides in the district, or possibly faces reelection from a new district with a new voter base. This is often employed against politicians who represent multiple urban areas, in which larger cities will be removed from the district in order to make the district more rural. The effect of gerrymandering for incumbents is particularly advantageous, as incumbents are far more likely to be reelected under conditions of gerrymandering. For example, in 2002, according to political scientists Norman Ornstein and Thomas Mann, only four challengers were able to defeat incumbent members of the U.S. Congress, the lowest number in modern American history. Incumbents are likely to be of the majority party orchestrating a gerrymander, and incumbents are usually easily renominated in subsequent elections, including incumbents among the minority. Mann, a Senior Fellow of Governance Studies at the Brookings Institution, has also noted that "Redistricting is a deeply political process, with incumbents actively seeking to minimize the risk to themselves (via bipartisan gerrymanders) or to gain additional seats for their party (via partisan gerrymanders)". The bipartisan gerrymandering that Mann mentions refers to the fact that legislators often also draw distorted legislative districts even when such redistricting does not provide an advantage to their party. Gerrymandering can affect campaign costs for district elections. If districts become increasingly stretched out, candidates must pay increased costs for transportation and trying to develop and present campaign advertising across a district. [ citation needed ] The incumbent's advantage in securing campaign funds is another benefit of his or her having a gerrymandered secure seat. In the seven states where Republicans had complete control over the redistricting process, Republican House candidates received 16.7 million votes and Democratic House candidates received 16.4 million votes. The redistricting resulted in Republican victories in 73 out of the 107 affected seats; in those 7 states, Republicans received 50.4% of the votes but won in over 68% of the congressional districts. While it is but one example of how gerrymandering can have a significant effect on election outcomes, this kind of disproportional representation of the public will seems to be problematic for the legitimacy of democratic systems, regardless of one's political affiliation. In response to these types of problems, redistricting transparency legislation has been introduced to US Congress a number of times in recent years, including the Redistricting Transparency Acts of 2010, 2011, and 2013. Such policy proposals aim to increase the transparency and responsiveness of the redistricting systems in the US. The merit of increasing transparency in redistricting processes is based largely on the premise that lawmakers would be less inclined to draw gerrymandered districts if they were forced to defend such districts in a public forum. Electoral systems with various forms of proportional representation are now found in nearly all European countries, resulting in multi-party systems (with many parties represented in the parliaments) with higher voter attendance in the elections,  fewer wasted votes, and a wider variety of political opinions represented. The use of fixed districts creates an additional problem, however, in that fixed districts do not take into account changes in population. Individual voters can come to have very different degrees of influence on the legislative process. This malapportionment can greatly affect representation after long periods of time or large population movements. In the United Kingdom during the Industrial Revolution, several constituencies that had been fixed since they gained representation in the Parliament of England became so small that they could be won with only a handful of voters ( rotten boroughs ). Similarly, in the U.S. the state legislature of Alabama refused to redistrict for more than 60 years, despite major changes in population patterns. By 1960 less than a quarter of the state's population controlled the majority of seats in the legislature. However, this practice of using fixed districts for state legislatures was effectively banned in the United States after the Reynolds v. Sims Supreme Court decision in 1964, establishing a rule of one man, one vote. Another means to reduce gerrymandering is to create objective, precise criteria to which any district map must comply. Courts in the United States, for instance, have ruled that congressional districts must be contiguous in order to be constitutional. This, however, is not a particularly binding constraint, as very narrow strips of land with few or no voters in them may be used to connect separate regions for inclusion in one district, as is the case in Illinois's 4th congressional district. Depending on the distribution of voters for a particular party, metrics that maximize compactness can be opposed to metrics that minimize the efficiency gap. For example, in the United States, voters registered with the Democratic Party tend to be concentrated in cities, potentially resulting in a large number of "wasted" votes if compact districts are drawn around city populations. Neither of these metrics take into consideration other possible goals,  such as proportional representation based on other demographic characteristics (such as race, ethnicity, gender, or income), maximizing competitiveness of elections (the greatest number of districts where party affiliation is 50/50), avoiding splits of existing government units (like cities and counties), and ensuring representation of major interest groups (like farmers or voters in a specific transportation corridor), though any of these could be incorporated into a more complicated metric. 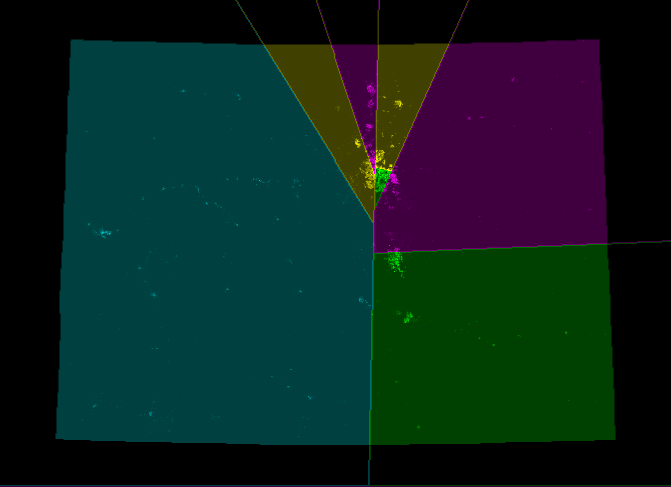 One method is to define a minimum district to convex polygon ratio [ definition needed ] . To use this method, every proposed district is circumscribed by the smallest possible convex polygon (similar to the concept of a convex hull; think of stretching a rubberband around the outline of the district). Then, the area of the district is divided[ further explanation needed ] by the area of the polygon; or, if at the edge of the state, by the portion of the area of the polygon within state boundaries. The efficiency gap is a simply-calculable measure that can show the effects of gerrymandering. It measures wasted votes for each party: the sum of votes cast in losing districts (losses due to cracking) and excess votes cast in winning districts (losses due to packing). The difference in these wasted votes are divided by total votes cast, and the resulting percentage is the efficiency gap. Several western democracies, notably Israel, the Netherlands, Slovakia and Slovenia employ an electoral system with only one (nationwide) voting district for election of national representatives. This virtually precludes gerrymandering. Other European countries such as Austria, the Czech Republic or Sweden, among many others, have electoral districts with fixed boundaries (usually one district for each administrative division). The number of representatives for each district can change after a census due to population shifts, but their boundaries do not change. This also effectively eliminates gerrymandering. In Queensland, malapportionment combined with a gerrymander under Premier Sir Joh Bjelke-Petersen became nicknamed the Bjelkemander in the 1970s and 1980s. Under the system, electoral boundaries were drawn so that rural electorates had as few as half as many voters as metropolitan ones and regions with high levels of support for the opposition Labor Party were concentrated into fewer electorates, allowing Bjelke-Petersen's Country Party (later National Party) led Coalition government to remain in power despite attracting substantially less than 50% of the vote. In the 1986 election, for example, the National Party received 39.64% of the first preference vote and won 49 seats (in the 89 seat legislature) whilst the Labor Opposition received 41.35% but won only 30 seats. Despite this, the Liberals/Nationals still received a greater combined share of the vote than the Labor opposition because the system also worked against the Liberal representation. In 2006, a controversy arose in Prince Edward Island over the provincial government's decision to throw out an electoral map drawn by an independent commission. Instead they created two new maps. The government adopted the second of these, designed by the caucus of the governing party. Opposition parties and the media attacked Premier Pat Binns for what they saw as gerrymandering of districts. Among other things, the government adopted a map that ensured that every current Member of the Legislative Assembly from the premier's party had a district to run in for re-election, whereas in the original map, several had been redistricted. Despite this, in the 2007 provincial election only seven of 20 incumbent Members of the Legislative Assembly were re-elected (seven did not run for re-election), and the government was defeated. For the Chamber of Deputies (lower house), 60 districts were drawn by grouping (mostly) neighboring communes (the smallest administrative subdivision in the country) within the same region (the largest). It was established that two deputies would be elected per district, with the most voted coalition needing to outpoll its closest rival by a margin of more than 2-to-1 to take both seats. The results of the 1988 plebiscite show that neither the "NO" side nor the "YES" side outpolled the other by said margin in any of the newly established districts. They also showed that the vote/seat ratio was lower in districts which supported the "YES" side and higher in those where the "NO" was strongest. In spite of this, at the 1989 parliamentary election, the center-left opposition was able to capture both seats (the so-called doblaje) in twelve out of 60 districts, winning control of 60% of the Chamber. France is one of the few countries to let legislatures redraw the map with no check. In practice, the legislature sets up an executive commission. 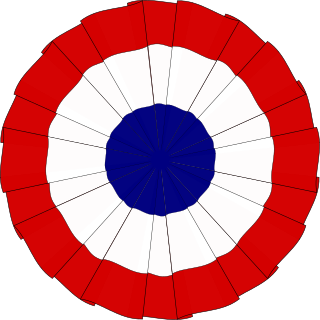 Districts called arrondissements were used in the Third Republic and under the Fifth Republic they are called circonscriptions. During the Third Republic, some reforms of arrondissements, which were also used for administrative purposes, were largely suspected to have been arranged to favour the kingmaker in the Assembly, the Parti radical. Gerrymandering has been rather common in Greek history since organised parties with national ballots only appeared after the 1926 Constitution. [ clarification needed ] The only case before that was the creation of the Piraeus electoral district in 1906, in order to give the Theotokis party a safe district. The most infamous case of gerrymandering[ citation needed ] was in the 1956 election. While in previous elections the districts were based on the prefecture level (νομός),[ citation needed ] for 1956 the country was split in districts of varying sizes, some being the size of prefectures, some the size of sub-prefectures (επαρχία) and others somewhere in between. In small districts the winning party would take all seats, in intermediate size it would take most and there was proportional representation in the largest districts. The districts were created in such a way that small districts were those that traditionally voted for the right while large districts were those that voted against the right. After the Francoist dictatorship, during the transition to democracy, these fixed provincial constituencies were reestablished in Section 68.2 of the current 1978 Spanish Constitution,  so gerrymandering is impossible in general elections. There are not winner-takes-all elections in Spain except for the tiny territories of Ceuta and Melilla (which only have one representative each); everywhere else the number of representatives assigned to a constituency is proportional to its population and calculated according to a national law, so tampering with under- or over-representation is difficult too. In the 1920s and 1930s, the Ulster Unionist Party created new electoral boundaries for the Londonderry County Borough Council to ensure election of a Unionist council in a city where Nationalists had a large majority and had won previous elections. Initially local parties drew the boundaries, but in the 1930s the province-wide government redrew them to reinforce the gerrymander. However, in the 1967 election, Unionists won 35.5% of the votes and received 60% of the seats, while Nationalists got 27.4% of the votes but received 40% of the seats. This meant that both the Unionist and Nationalist parties were over-represented, while the Northern Ireland Labour Party and Independents (amounting to more than 35% of the votes cast) were severely under-represented. From the outset, Northern Ireland had installed the single transferable vote (STV) system in order to secure fair elections in terms of proportional representation in its Parliament. After two elections under that system, in 1929 Stormont changed the electoral system to be the same as the rest of the United Kingdom: a single-member first past the post system. The only exception was for the election of four Stormont MPs to represent the Queen's University of Belfast. Some scholars believe that the boundaries were gerrymandered to under-represent Nationalists. Other geographers and historians, for instance Professor John H. Whyte, disagree. They have argued that the electoral boundaries for the Parliament of Northern Ireland were not gerrymandered to a greater level than that produced by any single-winner election system, and that the actual number of Nationalist MPs barely changed under the revised system (it went from 12 to 11 and later went back up to 12). Most observers have acknowledged that the change to a single-winner system was a key factor, however, in stifling the growth of smaller political parties, such as the Northern Ireland Labour Party and Independent Unionists. Current rules historically favouring geographically "natural"[ clarification needed ] districts, this continues to give proportionally greater representation to Wales and Scotland. Under the Sixth Periodic Review of Westminster constituencies, the Coalition government planned to review and redraw the parliamentary constituency boundaries for the House of Commons of the United Kingdom. The review and redistricting was to be carried out by the four UK boundary commissions to produce a reduction from 650 to 600 seats, and more uniform sizes, such that a constituency was to have no fewer than 70,583 and no more than 80,473 electors. The process was intended to address historic malapportionment, and be complete by 2015. Preliminary reports suggesting the areas set to lose the fewest seats historically tended to vote Conservative, while other less populous and deindustrialized regions, such as Wales, which would lose a larger proportion of its seats, tending to have more Labour and Liberal Democrat voters, partially correcting the existing malapportionment. An opposition (Labour) motion to suspend the review until after the next general election was tabled in the House of Lords and a vote called in the United Kingdom House of Commons, in January 2013. The motion was passed with the help of the Liberal Democrats, going back on an election pledge. As of October 2016 [update] , a new review is in progress and a draft of the new boundaries has been published. 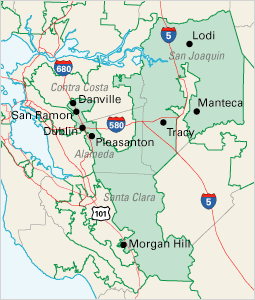 An electoral district, (election) precinct, election district, or legislative district, called a voting district by the US Census is a territorial subdivision for electing members to a legislative body. 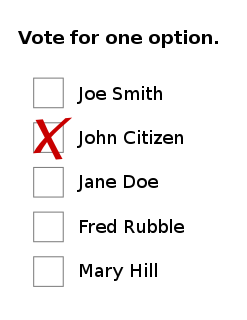 Generally, only voters (constituents) who reside within the district are permitted to vote in an election held there. From a single district, a single member or multiple members might be chosen. Members might be chosen by a first-past-the-post system or a proportional representative system, or another voting method entirely. Members might be chosen through a direct election under universal suffrage, an indirect election, or another form of suffrage. The Bjelkemander was the term given to a system of malapportionment in the Australian state of Queensland in the 1970s and 1980s. Under the system, electorates were allocated to zones such as rural or metropolitan and electoral boundaries drawn so that rural electorates had about half as many voters as metropolitan ones. The Country Party, a rural-based party led by Joh Bjelke-Petersen, was able to govern uninhibited during this period due to the 'Bjelkemander'. In electoral systems, a wasted vote is any vote which is not for an elected candidate or, more broadly, a vote that does not help to elect a candidate. The narrower meaning includes only those votes which are for a losing candidate or party. There is debate over whether votes that fall under this narrower definition are indeed wasted. A broader definition includes surplus votes for winning candidates who would have won anyway without the wasted vote. 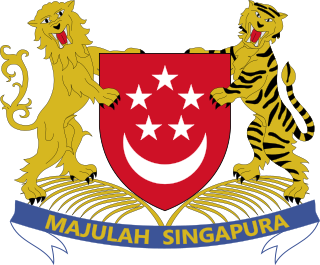 Constituencies in Singapore are electoral divisions which may be represented by single or multiple seats in the Parliament of Singapore. Constituencies are classified as either Single Member Constituencies (SMCs) or Group Representation Constituencies (GRCs). SMCs are single-seat constituencies but GRCs have between four and six seats in Parliament. California is the most populous U.S. state and as a result has the most representation in the United States House of Representatives, with 53 Representatives. Each Representative represents one congressional district. Virginia is currently divided into 11 congressional districts, each represented by a member of the United States House of Representatives. The number of Virginia's districts remained unchanged following the 2010 Census. There are a number of complications and issues surrounding the application and use of single transferable vote proportional representation that form the basis of discussions between its advocates and detractors. Redistribution is the process, used in many Commonwealth countries, by which electoral districts are added, removed, or otherwise changed. Redistribution is a form of boundary delimitation that changes electoral district boundaries, usually in response to periodic census results. Redistribution is required by law or constitution at least every decade in most representative democracy systems that use first-past-the-post or similar electoral systems to prevent geographic malapportionment. The act of manipulation of electoral districts to favour a candidate or party is called gerrymandering. Redistricting in California has historically been highly controversial. Critics have accused legislators of attempting to protect themselves from competition by gerrymandering districts. Conflicts between the governor and the legislature during redistricting often have only been resolved by the courts. ↑ Elster, Charles (2005). The Big Book of Beastly Mispronunciations. Boston: Houghton Mifflin. p. 224. ISBN 9780618423156. OCLC 317828351. ↑ "gerrymander". The American Heritage Dictionary of the English Language (5th ed.). Boston: Houghton Mifflin Harcourt. 2014. ↑ "The ReDistricting Game". www.redistrictinggame.org. USCAnnenbergCenter. Retrieved 10 February 2017. ↑ "gerrymandering | politics". Encyclopedia Britannica. Retrieved 27 May 2017. ↑ Barasch, Emily. "The Twisted History of Gerrymandering in American Politics". The Atlantic. Retrieved 27 May 2017. 1 2 Martis, Kenneth C. (2008). "The Original Gerrymander". Political Geography . 27 (4): 833–839. doi:10.1016/j.polgeo.2008.09.003. ↑ There is no evidence that the famous American portrait painter Gilbert Stuart had any involvement with either the design, drawing, or naming of the cartoon, or with the coining of the term. Detailed biographies and academic journal articles about Stuart make no reference to gerrymandering. The myth of Stuart's association with the original gerrymander has been reproduced and spread without verification or sources, from one reference book and Internet site to another. Modern scholars of Stuart agree that no proof exists to credit him with the term or cartoon and that he tended not to be involved with such issues. Martis, Kenneth C. (2008). "The Original Gerrymander". Political Geography. 27 (4): 833–839. doi:10.1016/j.polgeo.2008.09.003. ↑ O'Brien, D. C. (1984). "Elkanah Tisdale: Designer, Engraver and Miniature Painter". Connecticut Historical Bulletin. 49 (2): 83–96. ↑ David Wasserman (19 August 2011). 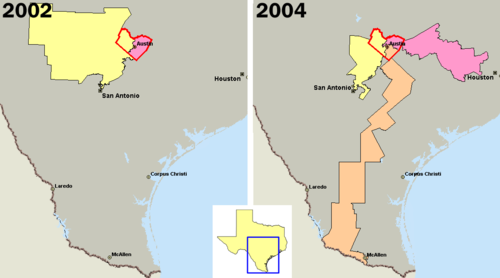 "'Perrymander': Redistricting Map That Rick Perry Signed Has Texas Hispanics Up in Arms". National Journal. Archived from the original on 9 May 2012. ↑ Mark Gersh (21 September 2011). "Redistricting Journal: Showdown in Texas—reasons and implications for the House, and Hispanic vote". CBS News. Retrieved 14 May 2012. ↑ Donald Harman, Akenson (1994). "Chapter 12: Kildare Street to Fleet Street". Conor. Vol1. McGill-Queen's Press - MQUP. p. 431. ISBN 978-0773512566 . Retrieved 15 November 2016– via Google Books. ↑ Michel Balinski (2008). "Fair Majority Voting (or How to Eliminate Gerrymandering)". American Mathematical Monthly. 115 (2): 97–113. doi:10.1080/00029890.2008.11920503. Incumbent candidates, in tailored districts, are almost certain of reelection (over 98% in 2002, over 94% in 2006). ↑ Schuck, Peter H. (1987). "The Thickest Thicket: Partisan Gerrymandering and Judicial Regulation of Politics". Columbia Law Review. 87 (7): 1325–1384. doi:10.2307/1122527. JSTOR 1122527. 1 2 3 4 5 Pierce, Olga; Larson, Jeff; Beckett, Lois (2 November 2011). "Redistricting, a Devil's Dictionary". ProPublica . Retrieved 25 December 2017. ↑ "Packing and cracking: The Supreme Court takes up partisan gerrymandering" . Retrieved 29 March 2018. 1 2 "A Deeper Look at Gerrymandering | PolicyMap". PolicyMap. 1 August 2017. Retrieved 12 April 2018. ↑ "gerrymandering - politics". Encyclopædia Britannica. ↑ Stephanopoulos, Nicholas; McGhee, Eric (2014). "Partisan Gerrymandering and the Efficiency Gap". University of Chicago Law Review. 82: 831. SSRN 2457468 . ↑ Stephanopoulos, Nicholas (2 July 2014). "Here's How We Can End Gerrymandering Once and for All". The New Republic. Retrieved 22 November 2016. ↑ Wines, Michael (21 November 2016). "Judges Find Wisconsin Redistricting Unfairly Favored Republicans". New York Times. Retrieved 22 November 2016. ↑ McCarty, Nolan; Poole, Keith T.; Rosenthal, Howard (July 2009). "Does Gerrymandering Cause Polarization?" (PDF). American Journal of Political Science. 53 (3): 666–680. CiteSeerX 10.1.1.491.3072 . doi:10.1111/j.1540-5907.2009.00393.x. ↑ Nagourney, Adam (14 February 2012). "New Faces Set For California in the Capitol". The New York Times. ↑ Ting, Jan C. "Boehner and House Republicans Lack Mandate to Oppose Obama." NewsWorks. NewsWorks.Org, 14 December 2012. Web. 5 February 2013. ↑ Wang, Sam. "The Great Gerrymander of 2012." The New York Times. 2 February 2013. Web. 5 February 2013. ↑ "Prison-Based Gerrymandering". The New York Times (Editorial). 20 May 2006. ↑ Initiative, Prison Policy. "New York Prison-Based Gerrymandering Bill". www.prisonersofthecensus.org. ↑ Initiative, Prison Policy. "New York Prison-Based Gerrymandering Technical Amendment". www.prisonersofthecensus.org. 1 2 Constitution of Spain in English (PDF). Madrid: Government of Spain. 1978. p. 35. ↑ Siegel, Jim (13 December 2011). "Study of GOP Maps Points to Politics". Dispatch.com. Retrieved 5 March 2013. ↑ Kusnetz, Nicholas (1 November 2012). "Behind Closed Doors: GOP and Dems Alike Cloaked Redistricting in Secrecy". NBC News. ↑ Wasserman, David (25 January 2018). "Hating Gerrymandering Is Easy. Fixing It Is Harder". fivethirtyeight.com. ↑ Nicholas Stephanopoulas. "Here's How We Can End Gerrymandering Once and for All" . Retrieved 8 May 2018. ↑ Bradlee, Dave. "Dave Bradlee". Gardow.com. Retrieved 3 September 2018. ↑ Wang, Sam. "The Great Gerrymander of 2012". The New York Times. Retrieved 3 September 2018. ↑ Korte, Gregory. "Technology allows citizens to be part of redistricting process". USA Today. Retrieved 3 September 2018. ↑ Fifield, B.; Higgins, M.; Imai, K.; Tarr, A. (2015). "A new automated redistricting simulator using markov chain monte carlo" (Working Paper). ↑ "How do other countries handle redistricting?". vox.com. 15 April 2014. ↑ "The Electoral System in Israel". Official Website of the Knesset. Retrieved 8 October 2018. ↑ Tilby Stock, Jenny (1996). "The 'Playmander': its origins, operations and effect on South Australia". In O'Neil, Bernard; Raftery, Judith; Round, Kerrie. Playford's South Australia: Essays on the History of South Australia, 1933–1968. Association of Professional Historians. pp. 73–90. ISBN 978-0646290928. ↑ Orr, Graham D.; Levy, Ron (2009). "Electoral Malapportionment: Partisanship, Rhetoric and Reform in the Shadow of the Agrarian Strong-Man". Griffith Law Review . 18 (18): 638–665. doi:10.1080/10854659.2009.10854659. SSRN 1579826 . ↑ Australian Government and Politics Database. "Parliament of Queensland, Assembly election, 1 November 1986" . Retrieved 17 July 2013. ↑ "No Christmas election: Binns". cbc.ca . 16 November 2006. Archived from the original on 2 July 2009. ↑ "Quand la politique découpe la géographie • 21Maps". 21maps.com. 15 March 2018. ↑ Wong, Stan Hok-Wui. "Gerrymandering in Electoral Autocracies: Evidence from Hong Kong". British Journal of Political Science. ↑ "The Changing Nature of the Parliamentary System in Kuwait" (PDF). p. 63 & 70. Due to the gerrymandering on the part of the government, the "tribes" from the 1980s onwards, came to occupy a significant number of seats in the National Assembly. ↑ Ulrichsen, Kristian Coates. "Kuwait: Political crisis at critical juncture". BBC. Retrieved 1 April 2019. ↑ Yang Berhomat Dr. Ong, Kiang Ming MP (19 July 2013). "Malaysia among the most malapportioned countries in the world" . Retrieved 19 February 2016. ↑ "In a historic election, Malaysia's allegedly corrupt prime minister lost to his 92-year-old former mentor who ran on behalf of a man he put in jail". Business Insider. 10 May 2018. Retrieved 10 May 2018. ↑ Calica, Aurea (18 March 2010). "Noynoy hits creation of Camarines Sur district for Dato". The Philippine Star . Retrieved 30 July 2013. ↑ Mendez, Christina (9 April 2010). "'Supreme Court ruling on Camsur clears Senate'". The Philippine Star . Retrieved 30 July 2013. ↑ Mendez, Christina (8 June 2013). "Senate fails to pass Nueva Camarines measure". The Philippine Star . ABS-CBNnews.com. Retrieved 30 July 2013. ↑ Balcells, Albert; B. Culla, Joan; Mir, Conxita (1982). Les eleccions generals a Catalunya de 1901 a 1923 (PDF). Barcelona: Fundació Jaume Bofill. p. 424. ↑ "The Island". www.island.lk. Retrieved 12 February 2018. ↑ "Ward Map of Vavuniya South (Sinhala) Pradeshiya Sabha - Vavuniya District" (PDF). ↑ "Ward Map of Vavuniya South (Tamil) Pradeshiya Sabha - Vavuniya District". ↑ "AKP redraws Turkey despite opposition ire". Hürriyet Daily News. 2012. Retrieved 16 January 2018. ↑ "How Democrats Fooled California's Redistricting Commission — ProPublica". ProPublica. 21 December 2011. ↑ Bycoffe, Aaron; Koeze, Ella; Wasserman, David; Wolfe, Julia (25 January 2018). "The Atlas of Redistricting: Gerrymander districts to favor Democrats". FiveThirtyEight. Retrieved 20 February 2018. ↑ Bycoffe, Aaron; Koeze, Ella; Wasserman, David; Wolfe, Julia (25 January 2018). "The Atlas of Redistricting: Gerrymander districts to favor Republicans". FiveThirtyEight. Retrieved 20 February 2018. ↑ King, Ledyard (28 November 2015). "Democrats face long house odds". Florida Today. Melbourne, Florida. pp. 1B. Retrieved 28 November 2015. ↑ "The WP: Parliament election was an unmistakable rebuff to Chávez". El Universal. Caracas. 1 October 2010. Retrieved 16 February 2017. ↑ King, Nancy J. (1993). "Racial Jurymandering: Cancer or Cure – A Contemporary Review of Affirmative Action in Jury Selection". 68. N.Y.U. L. Rev. : 707. ↑ Fukurai, Hiroshi (2001). "Critical Evaluations of Hispanic Participation on the Grand Jury: Key-Man Selection, Jurymandering Language, and Representative Quotas". 5. Tex. Hisp. J.L. & Pol'y 7. Wikimedia Commons has media related to Gerrymandering .